A popular and quite versatile design element for the garden is natural stone. When you think of stonework you’re apt to envision stone walls for retaining a hillside, or perhaps used for patios and stairs. But what if we approached stones as purely design elements, a way to incorporate the most natural of elements into our gardens? Cairns: I saw this cairn many years back, perhaps it was at the famous Philadelphia Flower Show, and I have been intrigued by them ever since. I have stacked stones before in my gardens: usually to get them out of the way as I planted. They were stacked for practicality first, design second. But now that I have more years in the garden I see the simple beauty of stacked stones. To secure the stones in place, add a dollop of cement between each stone or have a professional drill a hole through the center of each stone and run a length of rebar through the stack. The rebar can be anchored in place, below grade, with cement for added stability. Or should you wish to introduce a water feature to the garden, consider placing the stones over a water reservoir and run a pipe through the stones. The water will travel up the pipe, cascade over the stones, spill into the water reservoir to repeat the journey once again. Benches: A bench is always a nice addition to a garden and can take on a sculptural look and feel when made of natural stone. This bench along a bike path in Ohio is useful and attractive. Stone was an obvious choice for a place with countless visitors- it is unlikely to fail or need repairs. Stone Gardens: Artfully arranged stones create nooks and crannies in which you can tuck in small plants like herbs and succulents. This rock garden is in a local park and has had a succession of caretakers, each arranging the stones here and there and adding small plants that do well in the hot sun and in exceptionally well-draining soil. 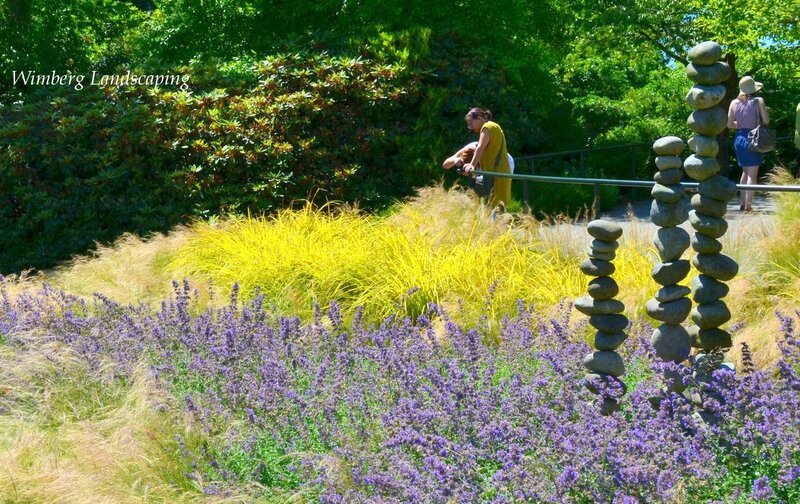 Zen Garden: You certainly do not need to create a Japanese garden as majestic as this one located in the Bloedel Reserve on Bainbridge Island, Washington, but it can serve as your inspiration. With this design, rocks are set on a bed of pea gravel or sand that is raked to create flowing patterns.